There’s a gentle hum, a soft light somewhere in the darkness. And it grows. A little hope that you’re not the only one in a vast universe. Isolated, alone and dying. When there’s truly nothing making noise, what do you hear? Is it nothing? Or is it the softness, the growing of a voice that resides below the normal hum and frequency of the universe. The voice of the Dark Star. The Dark Star is what we would use to create long reverberated pads. The noises underneath the lead. The mood setter. That’s the Dark Star. The way a song feels. That’s because of the Dark Star. 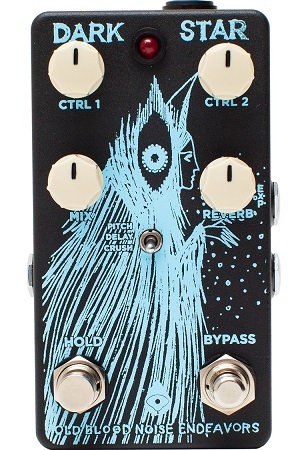 At its heart, the Dark Star is a Reverb. Then the Reverb signal passes through three possible modes: Pitch, Delay and Crush. CTRL 1 and CTRL 2 correspond with the selected mode. In Pitch, you’ve got two independent pitch controls for + and – an octave. In Delay, you’ve got the Delay Time and Delay Feedback. In Crush, you’ve got a pitch control for +/- an octave and then a control for Bit Crush. The Mix and Reverb knobs control the mix of dry/wet signal and the decay of the reverb, respectively. Voltage: 9VDC -60 mA draw.